ControlCenter Compact 80 CAT Dynamic Ports 3HU is fully compatible with DVICenter, ControlCenter-Digital and the end components for computer and workstation connections. One central module, a number of workstation module and a number of PC modules. High performance in compact form - the new ControlCenter-Compact. You can operate up to 79 computers over up to 79 simultaneous user modules depending on the variant. 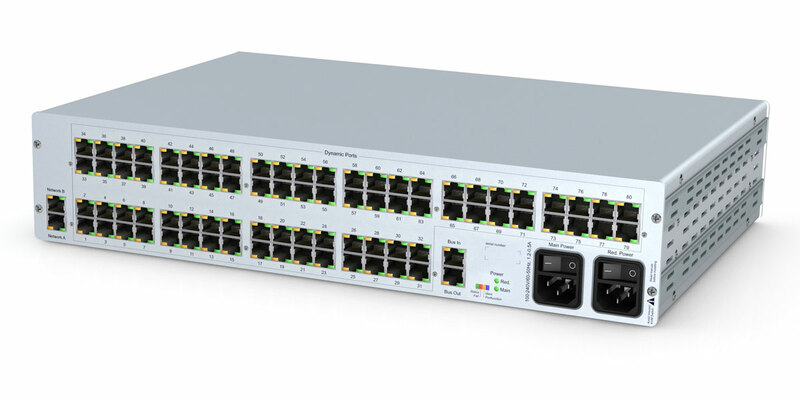 The up to 80 available ports can be combined as desired. A KVM matrix system of the ControlCenter Compact series consists of at least one central module, one workstation module and one target module. The central module of the ControlCenter Compact series is the central component of the KVM matrix system. The workstation and target modules are connected to this. The KVM matrix system enables a workstation module to be connected to a target module. The video image of the computer connected to the Target module is displayed on the workstation monitor. Use the keyboard and mouse of the workstation to operate the connected computer. The ControlCenter-Compact is available in CAT, fiber and mixed versions. This ensures that you can always use the right KVM matrix system for your application. The ControlCenter Compact series is fully compatible with DVICenter, ControlCenter-Digital and the end components for computer and workstation connections. These also include the DP1.2 vision systems with which latency-free signal transmission of 4K video at a full 60 Hz repetition rate through the matrix is possible. The ports can be used to connect either a user module or a target module.